Brompton Cemetery is screening The Matrix in September. Photo by Flamenco Sun, in the Londonist Flickr pool. As Morrissey once warbled, there's nothing better to do on a (dreaded) sunny day than hang out at the local cemetery. Unlike Morrissey, though, you don't have to gravely read the stones until it makes you want to cry. 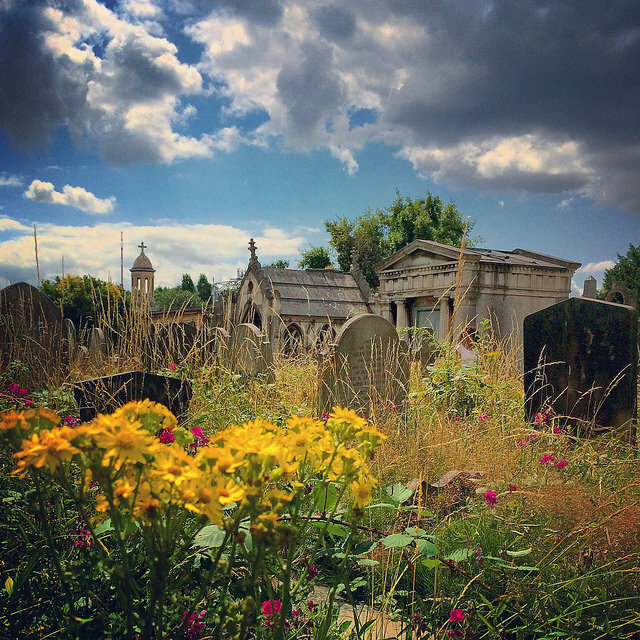 London's cemeteries are full of life this summer — here's a handful of happenings between now and September. Each of the five days of Shuffle Festival — held in the the 31 wooded acres of Tower Hamlets Cemetery Park — has a theme. 'Nature' kicks off proceedings — events include a wildflower and butterflies walk, picnicking in a glade, and a screening of Spirited Away. The final day of the festival is fittingly themed around 'Death', and features death-defying treetop acrobatics, a bat walk and Mexican sugar skull face painting. There's also another picnic in a glade, so that's good. Patrons of Shuffle include Jarvis Cocker, Professor Brian Cox and Danny Boyle, and it's fast becoming a stalwart of the east London festival scene. Entry to the cemetery is free. Prices vary, depending on the event. 30 July-3 August.